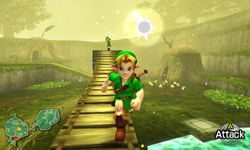 Ocarina of Time Comparison Video – Let Navi Fly! Even though I have now played through most of the game, I am still constantly amazed by the new graphics. I thought that after I’d beaten the first few dungeons with Link, I’d be used to it. But seeing Link grown up and in 3D, just refueled my desire to see more. For those who have never played the game, this is only a small spoiler of the intro to the game. It gives a great view of the new Kokiri Forest. It’s one of the first things you see in the game, and I was very excited when I first turned it on. As you can see, the forest is much brighter. Even the water seems to glow in comparison to the N64 version. I think the new fairy wings are kind of…droopy, but that’s just my opinion. There’s also a minor change in her pathway too just before she smacks her face into the fence wall. For those who have the game, are the new graphics as good as you had hoped they would be? Or are they better? I’m glad they didn’t go for a different style, so it still looks like the original, but more refined.